These looks are totally wearable. Halloween has descended upon the world. Pumpkin spice everything is everywhere, Hocus Pocus plays constantly, and everyone is looking for the perfect costume. This makeup artist’s Sailor Moon inspired makeup may just be your new costume inspiration. Before you imagine a Sailor Jupiter or Sailor Venus look, though, get ready to be surprised. Reddit user Taidyee took the cartoon makeup look in a totally different direction, and it’s basically perfect. 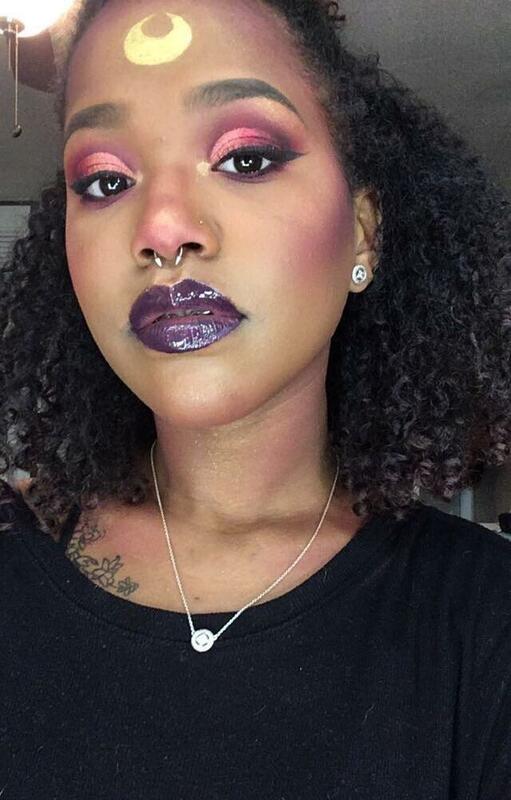 On Reddit, Taidyee posted an image of herself in a gorgeous neon pink cut crease, killer liner, and deep plum lip. While the makeup would be fire on its own, she then added a crescent moon to her forehead. That’s right. Taidyee’s Halloween look was none other than Serena’s—aka Sailor Moon’s—cat Luna. The solid black cat with a golden moon on her forehead and deep pink eyes is the inspiration for the look, and it’s spot on. In the post to Reddit, Taidyee explains that during Sephora’s Weekly Wow, she purchased the Urban Decay Moondust palette, and in order to “challenge” herself, she decided to attempt a cut crease. Clearly, it was a success, and the resulting look doesn’t just give serious nostalgia, it’s also wearable for a night out. Taidyee did not specify whether she was inspired by Luna’s human or cat form, but based on her black T-shirt and pink eye look, it’s more than likely Luna’s cat form. Fans of the anime will know that while Luna’s human form typically has blue eyes, her cat form has red-pink pupils. Other than its presence on streaming sites like Hulu, Sailor Moon hasn’t been aired in the United States for quite some time, but it hasn’t stopped people and brands from expressing their love for the iconic ’90s era anime. In fact, earlier this year, a makeup artist transformed herself into every single Sailor Scout, and needless to say, it was incredible. From Sailor Moon herself to Sailors Neptune and Pluto, she nailed every single one. If you want to rock a Sailor Moon—or a Sailor Scout—costume for Halloween, you probably won’t be alone, and as it turns out, getting the look is just a matter of being creative. Taidyee’s Luna is achievable, wearable, and still obvious enough to be the perfect makeup look if you’re wanting to embrace your inner cat guardian. What other Sailor Moon looks are out there that you can try, though? If you’re in the mood for another type of throwback, MannyMUA has always been open about his love of Sailor Moon, and in this video, he’s giving fans’ the low down on how to be the leader of the Sailor Scouts for Halloween. In this tutorial not only can you learn how to get the look of the Black Lady from Sailor Moon, but you can also learn how to get the hairstyle. Clearly, there’s a ton of different takes on the Sailor Moon characters, and you don’t just need to stick to the titular character. Whether you want to be Sailor Moon, Mars, Venus, Mercury, Jupiter, or one of the other scouts that weren’t shown on cable in the U.S., you’ve got tons of options. Don’t forget, though, that it’s not all about the women of Sailor Moon. Taidyee’s Luna makeup is proof that you can translate any of your favorite characters into the perfect look for Halloween, and look fierce while you do it.